Tucked behind the main house, the gift shop served as a summer kitchen, used to keep the house cooler during the summer months. And a separate entrance on the side, in the back portion of the building, gave access to what is believed to have been Doctor Scribner's office, now our office. 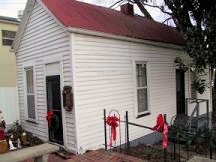 The Summer Kitchen serves as our gift shop as well as the office in the back room. The gift shop is open during the holidays, and also during the school year when the various elementary school classes tour the house and property. 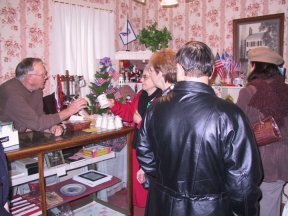 Here the gift shop is in full swing during the annual Christmas Open House and Victorian Tea.